Upgraded - With rubber sucker, it can fit smartphones, tablets and computers, such as iPhone 7plus/7/6plus/6/5, Samsung, Sony, Blu, Huawei Honor, iPad and many other brands. No more size limits. 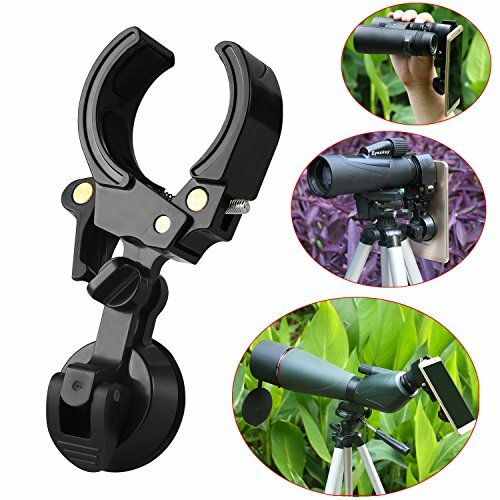 Universal - compatible with binoculars, monocular, spotting scope, microscope or astronomical telescope whose eyepiece outer diameter is between 27-53mm. Protective - Your smartphone or tablet is well protected by high density EVA pads. Keep your device from scratch and damage. Sturdy and durable - Mainly made of high strength PVC Plastic. One purchase for long-term use. Compact and Light Weight - 94g (3.31oz), convenience and easy to carry anywhere you want. Easy to operate - 6 simple steps to get amazing images and videos, record your memory. Note: Please make sure that the outer diameter of the eyepiece is between 27-53mm. All our products have been covered by a Limited Lifetime Warranty. We guarantees these products to be free of defects in materials and workmanship for the lifetime of the original owner. These warranties do not cover consumer caused damages such as misuse, abuse or repairs attempted by someone other than our authorized technicians. If you have any questions about this product by Eyeskey, contact us by completing and submitting the form below. If you are looking for a specif part number, please include it with your message.